Discussion in 'Clarity' started by bwilson4web, Dec 6, 2017. Understand I am a friend but not an advocate for the Honda fuel efficient cars. However, it looks like the Clarity is more practical than either of the Insights and may have longer legs than the Civic hybrid. 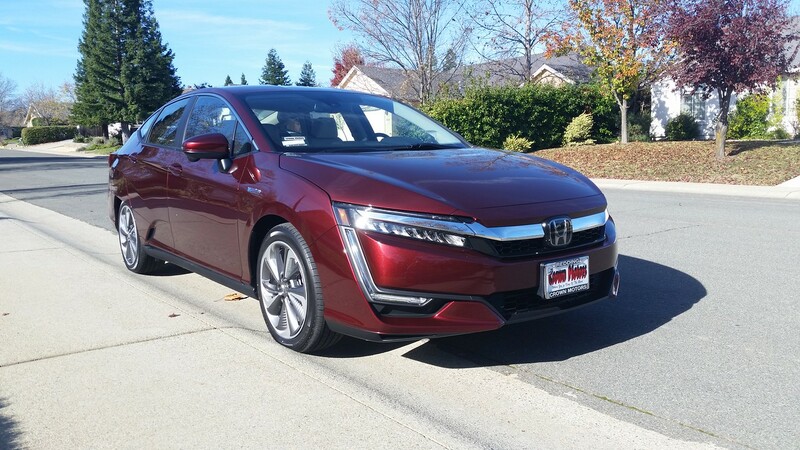 We bought the first Honda Clarity off the truck Tuesday December 5th. We absolutely love the car. It's not perfect, but its the nicest and quietest car we've ever owned. We've driven it 206 miles without using a drop of gas. This car was perfect for us. We live in the small remote city of Redding CA. The city is only about 7 miles in diameter so round trips are well within the 47 mile EV range. We daily take our son to school which is in a suburb 12 miles away. If my wife drops him off, goes to church, then to a store, and home, using the heater on cold mornings she'll use 30 miles of range. This coming weekend we will visit relatives 150 miles away so the hybrid mode will finally use some gas. I'll be glad to answer any questions about the car. We bought the Touring model. hanman and Domenick like this. If I was in the market for a PHEV, I'd probably lean more toward the Volt for a number of reasons: I'm more familiar with it, prefer the styling, have confidence in GM's plug-in engineering. Still, cars are (obviously) not one-size-fits-all, so it's great to see the Clarity PHEV get some love too. Maybe I be more appreciative after I learn a bit more. Once a 100% Honda family we drifted over to Toyota, and are now coming back. Both brands are good, it was just a matter of the right car at the time. So returning to Honda we find they've come out with many things that weren't available then. This car is in a whole different class than the Prius Prime. I appreciate the Volt but with only 4 seats and 10 Cu Ft of cargo space we didn't even consider it. I also am still concerned about long term reliability of GM cars in spite of the Volt's good track record. With a combined 200,000 miles on our two Prius cars we had exactly zero problems. Not so much as a loose screw. I'm not too concerned about how a car looks. The evidence is we've owned two Prius cars since 2008. But looks are subjective and I do think the Clarity is a very nice looking car. Some complain about the way the rear wheel well is designed. It doesn't bother me. Being a sedan, switching from a Prius which is a hatchback, there is no rear windshield wiper. The LED high beams are not as good as the Prius which was quite good. I like the placement of the plug in hatch just forward of the driver's door. That way the driver can simply plug in without having to walk around the car. Some Plug-In cars have the hatch by the right rear area. Entry and exit are exactly the same as the Prius which is good because we liked it. Grab the door handle and it unlocks. The car can be unlocked from the driver's door, front passenger door, and trunk. When exiting the car just push the black button. Keep the key fob in the pocket at all times. Cargo space is very important to us. Mostly it is about the ton of stuff we put in the trunk for beach days. The Prius would swallow huge amounts of stuff. The Clarity has 15.5 Cu Ft of cargo space, and fold down rear 60/40 seats. The interior of the Clarity is elegant. It is the opposite of the Prius Prime with it's flashy accents. The steering wheel is rich with buttons. The main gauges are right in front of the driver where they should be. After 9 years of driving a Prius I hated the center mounted gauges. The 8" screen is a practical size and in my opinion quite adequate. I really didn't want the huge screen of the Prius Prime or Tesla. They seem out of place where the Clarity LCD panel seems to blend in much better. The electronic features are way beyond a brief description. I've been in the high tech industry, both hardware and software, my whole working life. I spent 10 years coding user interfaces. I've built my own desktop PCs. I'm the family and friend go-to person for technical things. The first night we had the car I sat in it for hours (having read the entire 600 page PDF user manual the night before) and had to leave the car because I was overwhelmed with all of the options. There are two USB power ports in front in addition to a 12V socket. There is also a 12V socket for the back seat passengers. The car is spacious. It is several inches wider than the Prius and Volt. Three adults can fit comfortably in the back seat. We bought the Touring model which has many soft touch surfaces. The Touring model has memory seats. When my wife approaches the car with her key fob and opens the door the seat moves to her driving position. Same with me. Very cool. My legs are much longer so it was difficult to get into the Prius after she drove. The Clarity has three modes. Econ, HV and Sport. Econ is full electric unless you push the car hard or the traction battery is low. We haven't had the engine kick in yet on our normal daily drives which include a few miles of freeway. The HV mode is Hybrid, much like the Prius where the engine is used quite a bit. (44/40/42 mpg). The sport mode combines the electric and ICE for more power. It is possible to charge the battery, drive in HV mode and conserve the rest of the battery charge to use later. One might, for example, drive on the freeway using hybrid mode for 100 miles, then switch to Econ battery only mode when driving around in the destination city. Furthermore it is possible to ask the ICE to recharge up to 57.7% of the traction battery while driving. The first thing we noticed about the Clarity is how quiet it is. Not only because the engine isn't running, but Honda did a bang-up job on sound deadening. On top of that the electric motor is almost silent so if feels like we're floating on a cloud when driving the car. This isn't a hot rod or a sport's car. It corners quite well but it is 1,000 pounds heavier than the Prius and I feel that added weight. In my case though I do like the softer more luxurious ride. It has 181 horse power in Econ mode which is quick but frankly we drive for economy so rarely ever put our foot down hard. Speaking of putting your foot down hard the Clarity has a "detent" built into the accelerator pedal. Pushing past that point while in Econ mode will fire up the ICE. Letting off on the pedal the ICE will shut down again. It's like entering sport mode but you don't have to push a button. This would be perfect for passing cars on a two lane highway. 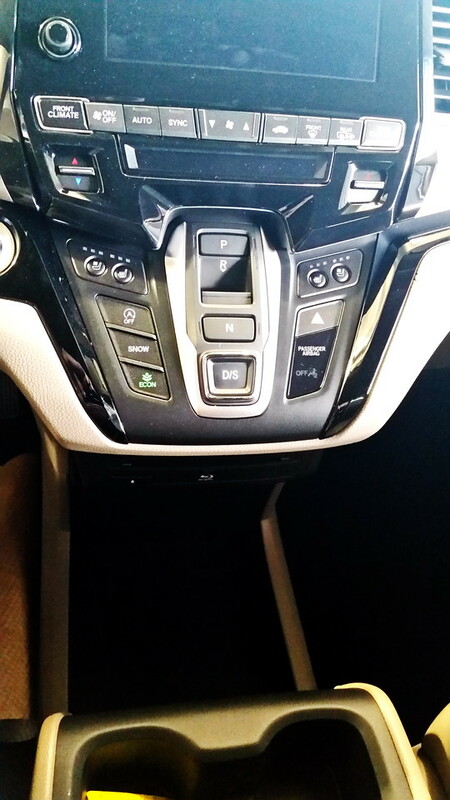 I have felt zero brake pedal grabbing or releasing when going in and out of regeneration. But then again I never felt it with the Prius where many people do complain about it. To me everything feels and sounds very smooth. Clearly the positives overwhelm the negatives in this car. We had to give up a few things but they are the nature of the beast. For example I swore I would never buy a car without a spare tire - but here we are. Cargo space is better than we thought it would be, but still not what we were used to. This car is a sedan so it has a sedan trunk. The lid is small and the opening could be better. Hatchbacks make so much more sense to me. Where Honda really screwed up is the fold down seats. There is a "pass-through" but not big enough for our son's small plastic kayak. The car has an internal structure that is not removable and hinders use of the area behind the seats and above the trunk. Ugh. I'm quite thrilled with the whole dash board area. It's simple but rich with features. Honda messed up in two ways in my opinion. 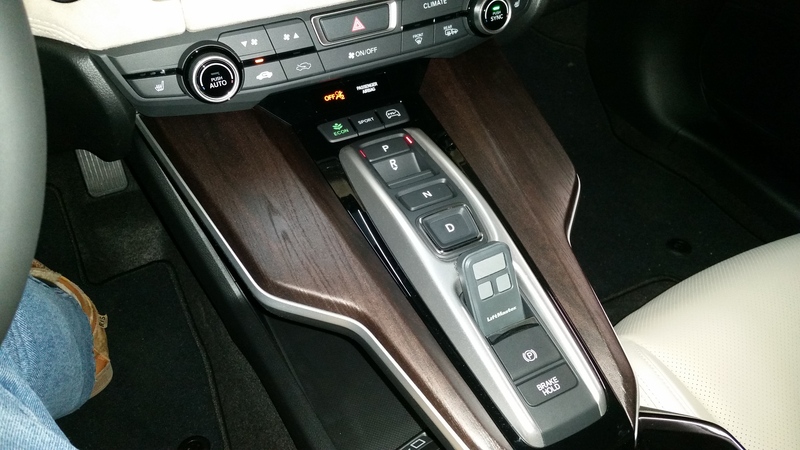 The center console is completely dedicated to shift buttons. The design looks like a patch, almost like they forgot to include the shift buttons until the last minute and one of the designer's six year old kids came up with the design they used. The Odyssey design looks much better. To make things worse those "wings" you see next to the shift buttons are non-functional. They could have been storage spaces. Which is the second thing that could have been better. There just isn't anyplace to put something small like coins. The armrest storage is small too. But really the trunk space, console, and storage trays are my only complaints. The list of positive things is gigantic. 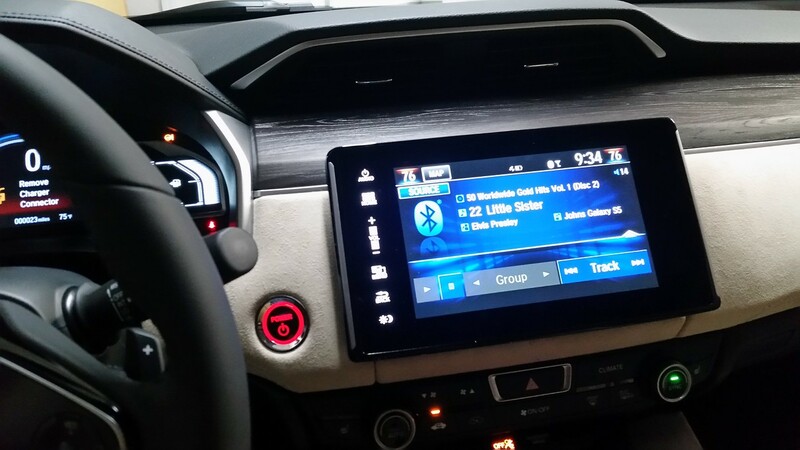 - HondaLink app for the smartphone. - A feature called "break hold" which works like this. The car is in Drive mode and you're in stop and go traffic. You stop with the brakes, then push the Break Hold button. You can take your foot off the break pedal. To go forward simply push the accelerator pedal. - Lane Departure warning shakes the steering wheel if you are leaving the lane without the directional signal turned on. - Lane Keep Assist LKAS steers to keep the car in the lane when between 45 and 90 mph, but demands you keep your hands on the wheel. It's an assist not a substitute driver. - Steering wheel paddles to increase or decrease regeneration. Handy when approaching a stop or going down a hill. There are many many more features. hanman, dstrauss, Rib and 6 others like this. - A feature called "break hold" which works like this. The car is in Drive mode and you're in stop and go traffic. You stop with the brakes, then push the Break Hold button. You can take your foot off the break pedal. If the car in front of you moves forward you can ease down on the accelerator and move forward. When you let up on the accelerator the car will come to a complete stop without you using the brake pedal. I had missed or had forgotten that the Clarity has a regen pedal like the volt/bolt. I rarely need to use the actual brake pedal! Does it work similarly? Or does it just switch between regen modes? I don't know how the Volt works. There isn't a regen pedal as such. There are two paddles (like some cars have shift paddles) behind the steering wheel. Pull on the left paddle and it applies more regen breaking. There are four levels of regen. Pull on the right paddle and it backs out one level. Oddly the left paddle is marked with a minus sign "-" and the right is marked with "+" which seems reversed to me. I would think + adds more regen. The regen can become pretty aggressive at level 4 but won't stop the car on que. On the Gen 2 Volt, pressing the regen paddle provides one level of regen, either on or off. To use paddle regen, you hold the paddle in. The Clarity has right and left side deceleration paddles. The paddle on the left (-) increases regen from 1 chevron to 4 chevrons. The paddle on the right (+) decreases regen from 1 chevron to 4 chevrons. My first impression was that you run through pressing the buttons until you get the level you want. However, holding the + paddle for a few seconds cancels the level. (page 390 of the owner's manual). Is it that you set the deceleration level, and that is what you get when you let off the accelerator? http://ev.owners.honda.com/Clarity/ModelInfo/PlugInOwnersManual?pageMenu=PlugIn I get the sense that you do not hold the paddle in for the regen action, but only use the regen paddles to set the desired regen level? There probably needs to be an instruction video tailored to former Volt drivers. In eco and normal modes, the regen levels cancel automatically after a few seconds. In sport mode, the action is said to be more aggressive. Also, in sport mode a "M" shows and the the level is not automatically canceled. (page 392, owner's manual). Also, in Volt, driving in L as opposed to D, allows for "one pedal" driving, where you feather the accelerator paddle for the desired speed and as soon as you let up, regen comes in gradually to slow the car. Regen that way can slow to a few mph, then the brakes can be used at the very end to stop. I've found posts that say the Clarity cannot do one pedal driving (there is no "L", only "D"), but supposedly the regen levels are more pronounced in Sport, and do not automatically cancel. So, I am wondering if there might be something similar to L in Sport with a higher level of regen? I only got one long night drive home with the new car and did not want to experiment too much with the paddles on my first drive, which was mostly highway driving anyway. Spent the drive experimenting with many other features such as ACC, LKAS, and the odd night driving screen brightness setting modes (for another post). BTW, my first impressions are very positive, the ride is sweet, the interior fit and finish is excellent, and the seats are very comfortable. We've only had the car for a week, mostly driven by my wife. So I haven't had too many chances to try out some things. I've played with the regen paddles but they seem like for normal stops at a stop sign or traffic signal using the break pedal will accomplish the same thing. We sold our 2008 Prius with 163,000 miles and the original brake pads still had 1/2 their thickness, this was just careful use of the break pedal to achieve maximum regen. I would think the best use for the regen paddle would be going down hill. I was not aware that regen cancels itself after a few seconds. I've used it when coming to a stop and knew it would automatically cancel then. I would want the regen to stay at the level I set it to so when I'm going down hill it can perform the breaking action needed as well as recharging the battery. Did you try it. Does it automatically cancel regen if you leave it in a given regen level for a while, all the time decelerating? I thought the right + paddle backs out from level 4 to 0 each time it is pulled. I didn't try holding it. That was a great write-up, @jdonalds, thanks for sharing. Long may she run. Good review too. It seems to confirm that the regen paddles are selector paddles to set the regen level. You don't hold the paddle in to get regen (as best as I can tell so far) like the Volt to actually get regen. Rather regen just happens when you let up on the accelerator. Also, in any mode but sport, you have to select your desired level of regen each time you decelerate (?) Or, select sport mode to hold that level as indicated by the "M" (possibly "manual" by the Honda transmission analogy). The note that regen was hard to detect suggests it might be a subtle effect (I hope to get out on a quiet road in days to come). The review's suggestion not to touch any of the buttons, might be reasonable for the regen selector paddles, but I think probably not for Econ mode, the two HV modes, and sport mode. For example, a short push of the HV button says it maintains the battery level if I remember correctly. That makes me wonder if there is a Volt like battery charge "hold mode" hidden in there. The nice thing about a hold equivalent (if possible by HV one short push) is that you can run full EV to the highway, change to HV gas engine ops (HV one short push) for highway driving, then resume full EV on local streets at the destination. I'm anxious to try regen "M" in sport. If it approaches "L" driving, the only drawback is that the engine runs all of the time, which kind of kills the coveted EV mode (to get the sporty feel by adding additional gas-engine torque). On the other hand, that sport mode is different from Volt, which adds no additional power, but just changes the relationship between accelerator setting and applied power (just re-maps the Volt accelerator position to power relationship, same power). Another minor error, the Volt had a nice feature called something like rear cross traffic detection. At a busy parking lot, when you back up, it could tell if a car was approaching and made a mark on the back up display and beep. The Clarity has something similar, the Electronics sensors "Back-Up option", a $500 option, which about $1,000 installed (adds ultrasonic sensors to the rear bumper, paint has to be matched too). In my initial research, none of the Touring models had this option already installed. Basically, aside from its exterior styling, they seemed to really like it. Well as we all say whether a car is ugly or beautiful is subjective. I just can't see the ugly here. To me the car is quite good looking. I would have bought it either way though. Yes the regen "-" paddle only needs a tap to add regen through 4 levels. A chevron/V shows up on the panel for each new level of regen. Each tap of the - paddle adds more regen. I think the top level is pretty aggressive. I use the combination of - and + to glide to a near stop before applying the brakes. As I said earlier though I'm not sure that is any better than just feathering the brake pedal. I hope my ODBII instrument will tell me when the physical brakes are applied. I would have liked the cross traffic feature. But the backup camera has three choices. One choice is a pretty wide angle view. The HV button has two modes. One quick push gets you hybrid mode. In this mode the 47 mile traction component of the battery is left mostly untouched. So you can reserve EV/Econ for another portion of your trip. Basically the car is in regular Prius mode at that point. The other thing you can do is hold the HV button for a few seconds to start the Charge mode which will recharge the traction battery up to 57.7% max. Most of the time this wouldn't be a cost effective way to charge the battery but one scheme I hope to try out this coming Saturday. We will be taking a 150 mile one way trip Saturday. 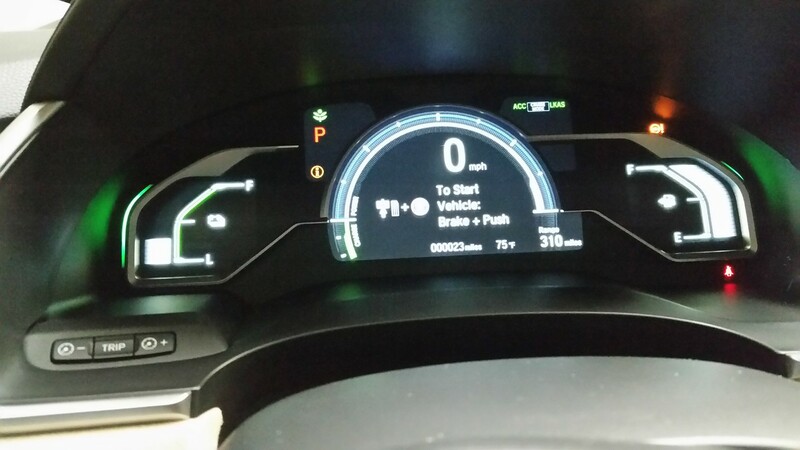 I plan to drive EV for 47 miles, then switch to HV/Charge mode. When the battery is back to 50%+ I'll switch back to Econ mode. Some say this will result in a much higher mpg overall. Our trip will be on almost completely straight and flat highway 5 down the central valley where this scheme is most likely to be beneficial. dstrauss and Domenick like this. I really like the way the Clarity looks outside and in. Now that I found my favorite one-pedal driving mode (sport + 4 chevrons M), I am in love! Well as we all say whether a car is ugly or beautiful is subjective. I just can't see the ugly here. If any of you are really considering buying a plug-in car you may want to seriously think of doing it before the end of the year. The new federal budget plan could kill the $7,500 tax credit after Dec 31st. It may survive as well. Nobody knows at this point. That uncertainty was a major factor for us buying the Clarity. If I knew the tax credit would continue into next year I may have waited to decide about the Hyundai Ionic plug in vs the Clarity. @ jdonalds: Hey, thanks muchly for taking the time to post that very detailed first-hand review of the Honda Clarity PHEV! It has 181 horse power in Econ mode which is quick but frankly we drive for economy so rarely ever put our foot down hard. Speaking of putting your foot down hard the Clarity has a "detent" built into the accelerator pedal. Pushing past that point while in Econ mode will fire up the ICE. Letting off on the pedal the ICE will shut down again. That pretty much alleviates the only concern I had about the car. I read a review that said the acceleration was uneven, claiming the car does not seamlessly blend in power from the gas generator with the electric motors, as the Chevy Volt does. But with the accelerator having a detent built in, to give the driver a warning that pushing past it will engage the ICEngine, then that would alleviate my concern. In fact, I'd prefer that to the Volt's undetectable blending because it will allow the driver to choose whether to engage the ICEngine or not! Personally I prefer smaller cars, and the oft-maligned Volt's back seat, which isn't big enough for three full-sized adults, would be quite adequate for me. 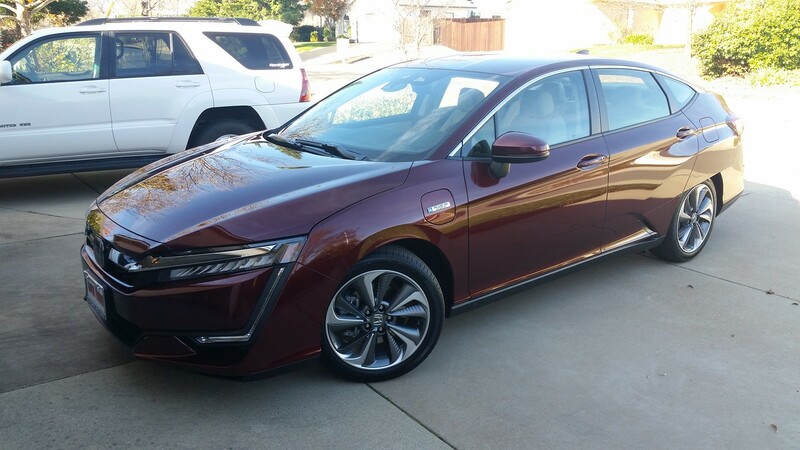 But I'll certainly keep your recommendation in mind, and the next time someone asks about PHEVs, I'll be sure to mention that they should look at the Honda Clarity PHEV if they want a family-sized car! I'm glad you're enjoying your new Clarity, and I hope that will continue to be the case for as long as you want to own the car. If any of you are really considering buying a plug-in car you may want to seriously think of doing it before the end of the year. The new federal budget plan could kill the $7,500 tax credit after Dec 31st. It may survive as well. Nobody knows at this point. That uncertainty was a major factor for us buying the Clarity. Yes, I think we are going to see a major spike upwards in U.S. PEV sales this month, even moreso than usual for December, for that very reason. As of today 286 miles driven with the Clarity. The driving consists of 25-30 mile round trips, on city streets and a freeway with speeds up to 70mph for just a few miles. Also a winding hilly country road of about 4 miles or so. When the dealer filled the gas tank on Dec 5 the car showed an ICE range of 297 miles. Today it still show 297 miles. The ICE has not fired up once in 7 days of driving. The car had a bit more use today than usual. We still have only a Level 1 charge capability so it is difficult to recover during the day with several trips. When I got in the car this evening to go to church the EV range read 16 miles. Church is 14 miles round trip. I drove carefully, didn't turn on the heat or heated seats even. When I got home I still had 4 miles of EV left. The battery was almost depleted, but the ICE never fired up. I am very pleased with the Clarity. I'm getting the full EV experience.